Inserting Sub Assembly into an existing or new drawing. Saved designs can be inserted into a drawing as many times as it is needed, e.g. the same Sub Assembly can be inserted multiple times. 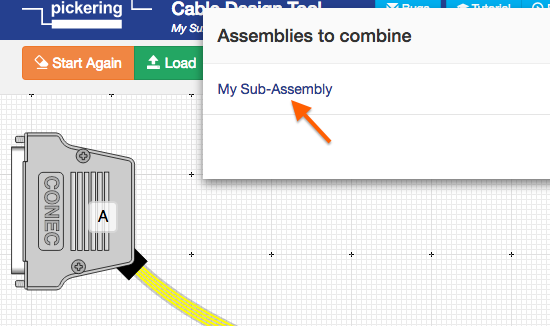 Use "Sub-Assemblies" in the Options dropdown list. It is also possible to have a visible menu bar button for the Sub-Assemblies by enabling in Options. 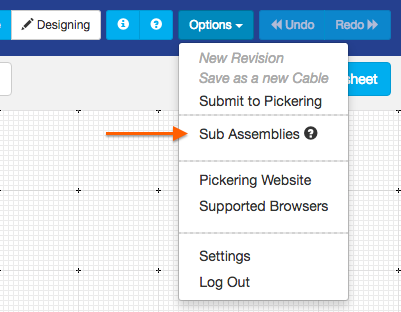 Sub Assemblies which have been hidden won't be displayed. When a sub-assembly is inserted, the two designs are combined. The location letters are updated. If the maximum number of connectors (56) would be exceeded (by inserting an assembly), the new sub-assembly insertion will fail. It is now possible to continue the design, i.e. connecting by a path between the two sub-assemblies. Pinouts for a sub assembly linking to a known connector can be pre-defined by using the Ghost Connector.